A spring show at CentreStage! In Mom’s Gift, Mom has been dead for 11 months and shows up at her husband’s birthday party as a ghost with a mission. Like Clarence in It’s A Wonderful Life, she has to accomplish a task to earn her wings. Only what the task actually is, is a mystery. There are so many things to fix. The problem is complicated by the fact that the only person who can hear or see Mom is her daughter, who has been ordered by the court to spend Dad’s birthday with him as part of her Anger Management Program. One by one the family's secrets are peeled away revealing a shocking truth that surprises even our ghost. 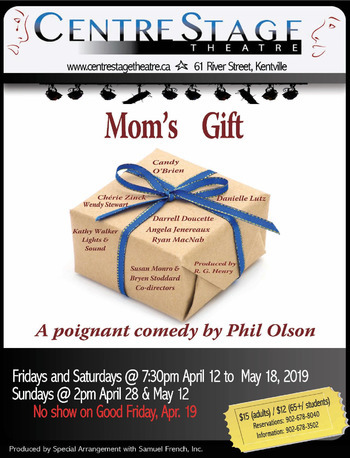 Mom’s Gift is directed by Susan Monro. Stage management is provided by Chérie Zinck. Lights and sound are presented by Kathy Walker. The cast in order of appearance: Candy O’ Brien. Chérie Zinck, Danielle Lutz, Wendy Stewart, Darrell Doucette, Angela Jenereaux , Ryan MacNab. The featured artist is Brenda Imlay. Cash or cheque only-adults $15; seniors/students $12; children, age 12 and under, $5. Reservations are recommended and are held until 15 minutes before show time. Call 902-678-8040 (24/7) to reserve your seat.